low calorie indian vegetables. low calorie subzi collection. The chief and foremost use of veggies is always creating a new subzi. We have researched and created new low calorie recipes that are suitable to be consumed on a weight loss diet. While making these healthy subzis, in this section we have avoided the use of the following ingredients. • High carb veggies like potatoes, sweet potatoes, yam and purple yam. • Excessive amounts of oil / ghee. • Given up on fresh cream completely. Instead we have focused on…. • Using a variety of greens. • Using a different combination of masalas and spices in each recipe. • Using a non-stick pan to limit the use of fat. 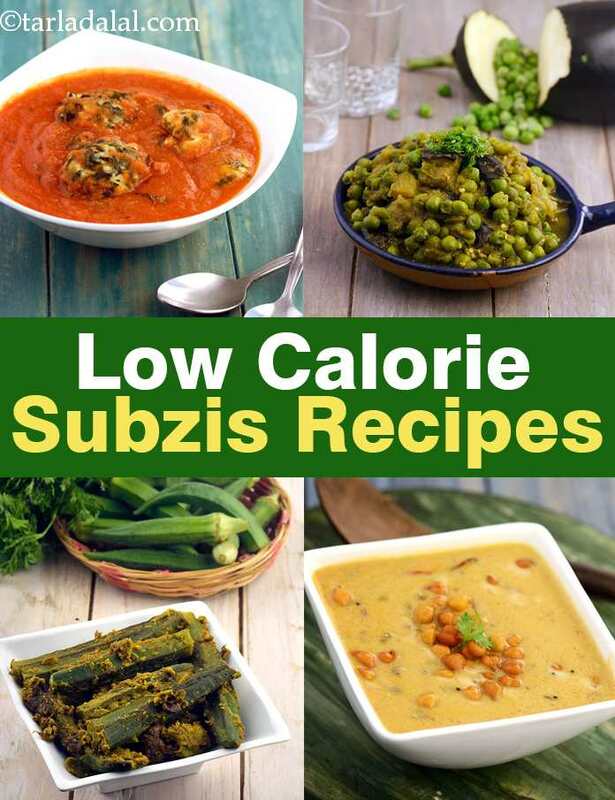 These delicious fibre rich low calorie dry subzis recipes will never make you miss those fat laden subzis that gain weight. Gavarfali ki Sukhi Subzi is a lip-smacking dry subzi that you can enjoy with steaming hot phulkas of your choice. Cluster beans are really rich in fibre and this recipe gives only 52 calories per serving and it’s a great source of Folic Acid and Calcium. If you’re fond of brinjals then you must definitely try this Ringna Vatana recipe and I’m sure you won’t regret trying it. Apart from being rich in fibre it is also a great source of protein. Who does not love bhindi’s? You will surely start loving this green vegetable if you try our low calorie recipe for Bhindi Masala. Being prepared with zero oil it is low in fat and gives only 83 calories per serving. Try this unique combination of dals and broccoli with this Spicy Broccoli Subzi recipe perked up with cumin seeds. Broccoli is an amazing low calorie vegetable with lots of health benefits. Another innovative recipe we have is for Bharwa Lauki, a flavourful recipe in which lauki is stuffed with low-calorie paneer which makes it more nutritious and rich in calcium and protein. This creamy Dahi Chane ki Subzi is sure to be loved by people of all generations. The pulses along with curds make it healthier and increase the protein and calcium content of it. Here's a great way to enjoy a Rajasthani delicacy that is simply sumptuous and low in calories. Choose young and tender bhindis for this recipe that will cook quickly. Above all, the rich and fascinating aroma is so tempting that you won't feel that you're eating low calorie food. Gavarfali ki Sukhi Subzi is a lip-smacking dry subzi that combines beautifully with phulkas fresh off the tava! The benefits of fibre-rich cluster beans are enhanced by the introduction of flavour-imparting garlic, which also keeps blood sugar and cholesterol levels under control.